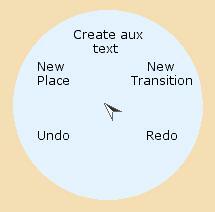 On the pages in a net, you can create places, transitions and arcs using either marking menus or palettes. Start by dragging a page out from the index. To create a place or a transition, bring up the Page marking menu by pressing and holding down the right mouse button on the page. See the marking menus page if you are unsure about how to work with marking menus. Now select New Transition or New Place. To create an arc, hold down the right mouse button on the place or the transition where you want the arc to begin. Either the Place marking menu or Transition marking menu appears. Select New Arc to start an arc. 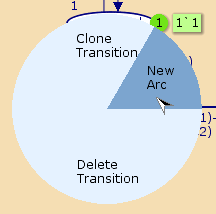 An arc will be attached to the cursor, and you can drag it to the transition or place where you want the arc to end. Click on the background to add bend points or on a transition or place to finish the arc. You can also add more bend points later by dragging the arc where you want the bend point to occur. An arc must go from a place to a transition or from a transition to a place. You can abort the creation of an arc by applying the Drop Tool tool before you attach the final endpoint. Use the Create tools Palette to create transitions, places, and arcs. See the palettes page if you are unsure about how to work with palettes. Click with the left mouse button where you want to create the element. When creating an arc, you can create bend points by clicking on the page background, just like for marking menus. If you want to cancel the arc, click again on the palette cell where you picked up the arc tool. Alternatively, bring up the Workspace marking menu and select the Drop Tool entry.